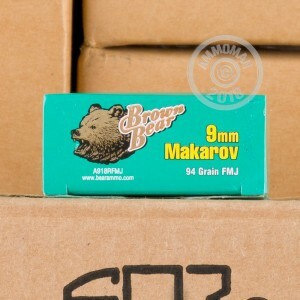 This affordable Brown Bear ammunition is just what the Makarov pistol was designed to fire. 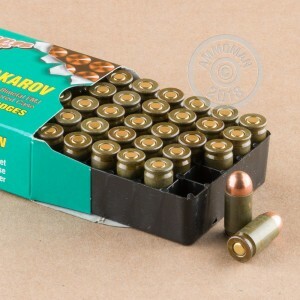 These Russian made cartridges come loaded with a 94 grain bimetal jacketed bullet. Each box contains 50 rounds. 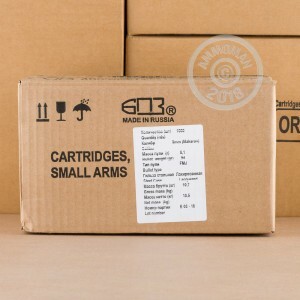 Brown Bear ammo is made at the Barnaul Machine Plant in Russia. It uses non-corrosive Berdan primers and non-reloadable steel cases coated for more reliable cycling. Not all indoor ranges permit steel cased ammo due to its magnetic properties, so check before ordering if unsure. Place an order for $99 or more at AmmoMan.com to enjoy free shipping! I have a Russian Makarov, I have had to buy inferior Red Chinese rounds, however I have found this ammo makes my pistol sing like a new one, I get really close groupings and my pistol is not filthy when I clean it, I buy this when ever I buy 9mmx18 also it cycles perfectly every time. never a jam up.